What is a wizard without a wand? In trouble. And what is a Munchkin player without a Munchkin bookmark? Still pretty cool, but missing out on some sweet bonuses in their game! 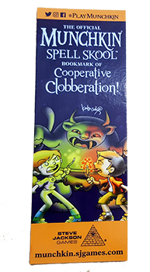 Our newest bookmark, The Official Bookmark of Cooperative Clobberation!, will solve both problems, and you can get it free with any Warehouse 23 order (while supplies last)! Using it makes your classmates help you in combat, but they get first treasure pick, and even a level if you share a Class. While it can be played with any game, it's perfect for our recent Walgreens release, Munchkin Spell Skool. Become a magical student, fighting the evil Moldy Mort and accomplices like the Rap Scallions, and join your favorite clubs, like Chess Club and Forbidden Magic Club. You can get a peek inside with our unboxing, and if you're new to Munchkin, check out the how-to-play! If you're a veteran of Munchkin and you'd like to know what sets to mix with Spell Skool, check out Andrew's article on mixing it with Munchkin Oz Guest Artist Edition. In addition to this bookmark, orders through Warehouse 23 always include some extra promotional goodies. So place your order today, and add some magic to your summer gaming!